Topoľčianky are famous for its history and present. The first written mention about Topoľčianky originates from the year 1293. Village is the former royal estate. In the year 1307 king Béla IV. had donated Topoľčianky to some Haslov who was the ancestor of lords have been living in the era of feudalism in Topoľčianky and dominating here for many years. In the period of threatening of the region town Starý Tekov (1561) by Turks, seat of the region had been moved to Topoľčianky. Topoľčianky was the seat of the region for 162 years. In the year 1723 seat of the region had been moved to Zlaté Moravce. At the place of present-day castle had been built a stone house which was rebuilt in accordance to allowance of particular owners and finally obtained today´s look. The last owner of manor-house and lordship were the Habsburgs. 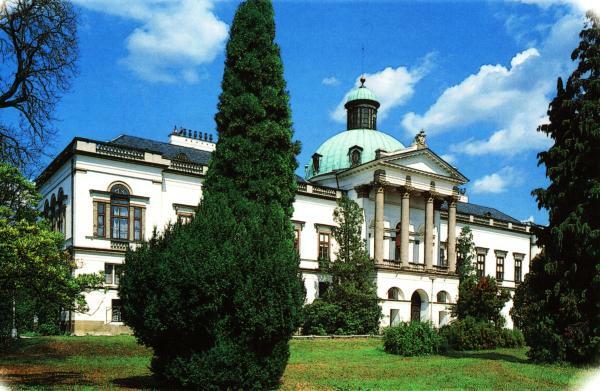 In the year 1918 after the foundation of the Czechoslovak republik the owner of the manor-house and of lordship became the Czechoslovak state. In the year 1921 from mountain parts of lordship were created national forests and from fields and horse-breeding was formated the State stud farm. 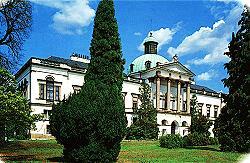 In the year 1923 the first Czechoslovak president T.G.Masaryk established a summer-residence in Topoľčianky until 1951. Since then castle has served only for recreational intentions. Nowadays Topoľčianky is famous as a centre of tourism and travelling. Topoľčianky was awarded this bylaw in the year 1992. To the most visited objects in Topoľčianky belongs the Classicistic-Renessaince manor-house declared the National cultural monument in 1970. The manor-house is situated in a park belonging with its dendrologic, country and architectonic importance to the worthest in Slovakia. - Národný žrebčín, š.p. (The National stud farm) - www.nztopolcianky.sk - thanks to its importance has achieved the first place in horse-breeding history and in reproducing of generous horse races in Slovakia. There are bred these horse races - Arab, Lipican, Hucul and sports warm-blooded horses. This company creates favourable conditions for persons interested in horseback-riding, carriage-riding and together with Štátne závodisko Bratislava, š.p. (the National field Bratislava) is a coordinator of three to four racing days a year, as many other competitions. 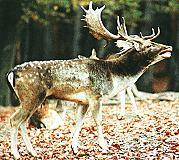 - Lesy Slovenskej republiky (The Forests of the Slovak republik) - OLZ Topoľčianky - famous for its big menagerie with its area of 11131 ha where are kept moufflons, red deers, bucks, fallow-deers and wild boars. 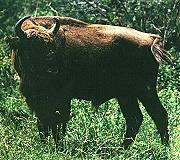 Very famous is menagerie of aurochs, founded in 1958. 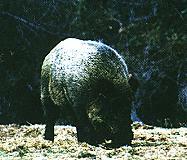 In 1964 was declared the Protected and Educational Area. Hunters can receive new experiences and spend fine moments in Poľovnícky zámoček (the Hunting castle) where you can be accomodated (but nowadays in reconstruction) or in other lodging-houses. - Vinárske závody Topoľčianky - Ravena, s.r.o. (vine production) - were created from the former Vinárske závody, š.p., Nitra in 1993 and became privat company with the main goal to revive glory of vines of Topoľčianky under the protected mark "Chateau Topoľčianky". - Mykoprogres, s.r.o., processing of field mushrooms in Topoľčianky - with annual production of field mushrooms over 2000t obtained the third place in Europe. Its total cultivate area is 78 618m2. - Castle Topoľčianky - owner of this building is The Uniform property fond of trade unions (Jednotný majetkový fond odborových organizácií) in Slovakia. It is the National cultural monument. In 1923 -1951 served as a summer-seat of presidents of the Republik. In the Classicistic wing is located museum of furniture, pictures and other historic equipment, futher there are keeping-rooms, reading-room and sauna with fitness centre. In hotel part are ninety beds. In neighbourhood of the Castle there are a playground and bowling, both have to be reconstructed. - Hotel The National house Topoľčianky (Hotel Národný dom Topoľčianky) - owner PPA Control Bratislava and village Topoľčianky. There are 32 double-bedded rooms and 5 big apartments with complex equipment of international niveau. In addition to this there are restaurant, coffee-bar, beerhouse and saloon for privat family celebrations. It is an ideal place for business meetings and negotiations. - TJ Tatran Topoľčianky - a sports area offering sports and regeneration experiences for sportmen and visitors with providing board and lodging in double-bedded rooms with refreshment in expresso TJ. Regeneration equipment consists of water-cure. It was built a sewage tank here. In the village there were founded The Museum of horse-breeding and a village folklore room. Thanks to existing companies and facilities, natural conditions, well-preserved and cared monuments, as an adverbial hospitality of inhabitants, Topoľčianky creats many opportunities for expansive and bigger tourism and travelling.